To my eyes, the tureen seems far happier in its new role as a vase. I feel happier, too, because I get to stop and admire its bouquet before I ascend the stairs. 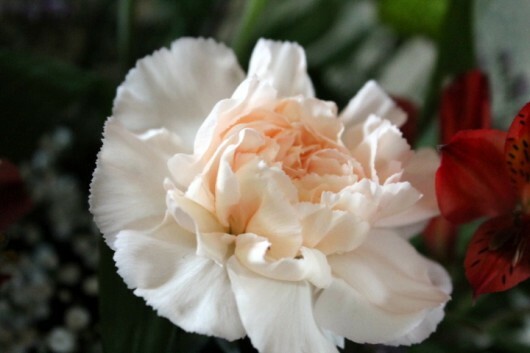 Contrasting but not clashing with Etna is the carnation ‘Light Pink Candy.’ The ruffled blossoms are peach, not pink. The soup is salted with white Alstromeria ‘Fuji.’ Its yellow-brushed, crimson-flecked, greenish-white petals are fun to study. 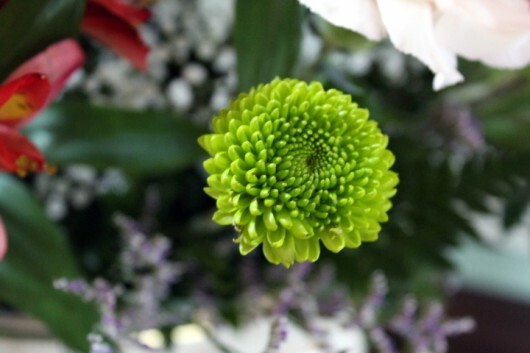 Providing texture and exotic color are stems of ‘Green Beret’ chrysanthemums. 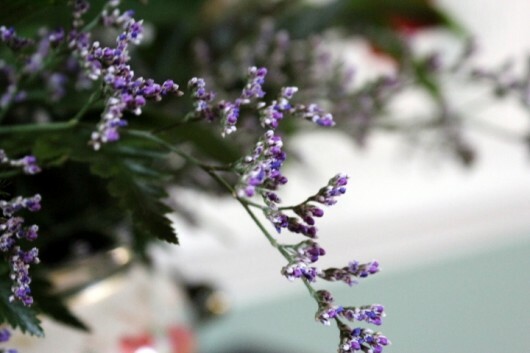 These button-like flowers are beautiful to behold and fun to caress. Well, I like to “pet” them. Lumonium ‘Purple Haze,’ one of my favorite “spillers,” adds luscious contrast to the red Alstromeria and peach carnations. Do you have little-used but still-cherished serving pieces hidden away? Maybe you can re-purpose them for vases. 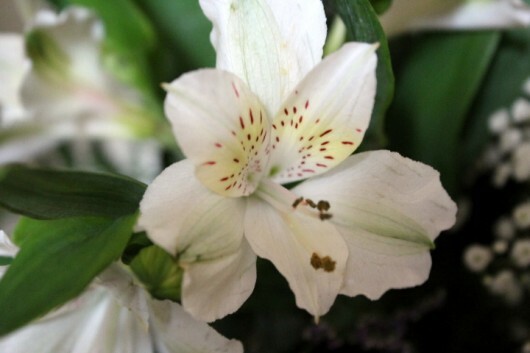 Believe me, the sight of fresh-cut flowers around the house will do wonders for your soul. And your serving pieces will be glad to come out of retirement. The arrangement turned out beautiful – kuddos to your florist! The oil painting above the vase is stunning ! Lisa – Why, thank you. I actually found quite a few old serving pieces I can use for arrangements. Next up: icy-pink roses in a silver-plated ice bucket! Quite lovely. The red alstromeria really plays well with the stair carpeting. 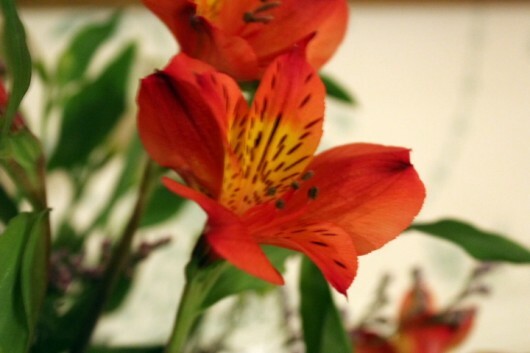 There is nothing better than fresh flowers to chase away winter doldrums! I have a very pretty silver water pitcher that just sits around getting tarnished between cleanings. The thought of using it for water after all that silver polishing doesn’t seem right, so I’ve always counted it among my most impractical posessions. I never thought of using it for some fresh cut flowers. I have 2 boys home sick from school today so can’t run any errands , so I had time to polish up the pitcher and will pick up some flowers later in the week. I’m excited to try to create something although it will not come close to Ms. Brady’s lovely work. My husband will be happy to hear he does not have to make a trip for flowers for Valentine’s Day since I’d rather pick out some myself. Honestly, I never thought about basing my flower choices on the vessel that is going to hold them. Thanks for a little artistic insight! That’s for helping me make up my mind! I have two large serving pieces in a friend’s booth in an antique store. They’ve been there for almost 3 yrs!!! I hated to let go of them from the beginning as I was downsizing and knew I’d never use them for their intended use. I can’t wait to go get them back and fill them with flowers!! Kate – You are right. 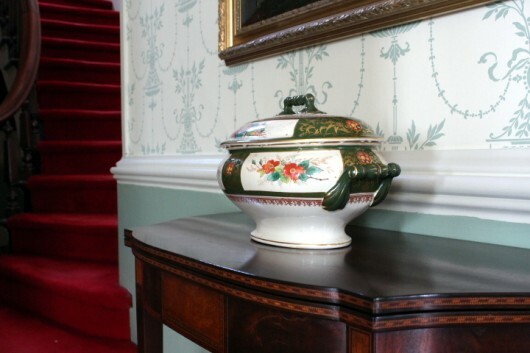 The red goes with the staircase as well as the red-orange on the tureen. badger gardener – Hope your boys are feeling better soon. We must have the same silver water pitcher. Mine looks so unappetizing on the inside that I wouldn’t dream of using it serve guests. Just now it is holding witch hazel branches in my bedroom window. Joyce – That’s music to my ears. Some serving pieces — say, my tureen — require only a block of oasis (water-absorbing foam-material available at flower and craft shops ) in which to hold the stems as you want them. Have fun! Kevin, the pictures are wonderful! So glad you liked it. I hope you have a Happy Valentines Day. Hi Deb – In a future post, I’m going to photograph the steps to “building” such an arrangement. Stay tuned! Kevin, fantastic how the colors take off from the soup tureen’s colors. I also love the painting above the arrangement. Photographing the individual flowers was a great idea. I can’t wait to see your step-by-step photograph of arranging. How about a video? When I was younger I took a floral design class and loved it. Wish I could find another class to refresh my skills. Thats gorgeous! I often use all sorts of weird things for vases.. Bottles, jars, pots, , shoot.. every once in a while I actually use a vase.. haha..
Im looking forward to the step by step photos. My grandmother was an award winning flower arranger and I just dont have it. I realize there is a method to it but I havent learned it yet. One day soon, Im going to take a class. LOVE this idea—Now I will use my Old Treasures !! Picked up the colors in the tureen beautifully!! What a feast for the eyes. 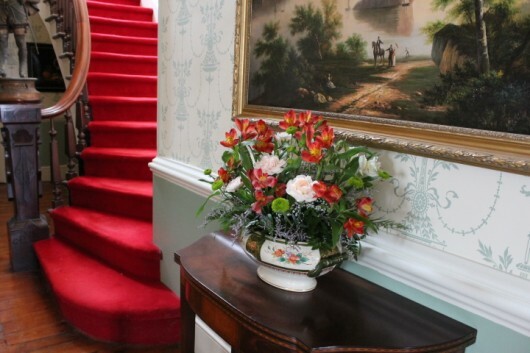 I love the carpeting on the staircase and the flower arrangement is beautifully tied in. 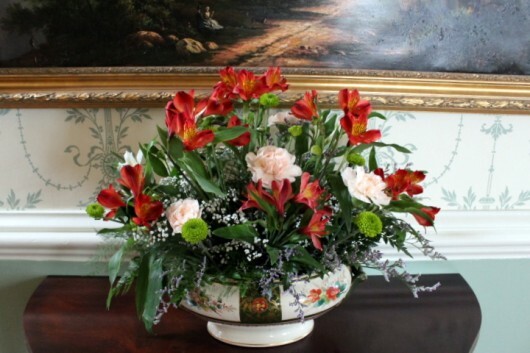 It is so lovely to use something that is not a vase to hold and display flowers. In this case the decorator did an excellent job. Your tasty culinary gems and commentary are great…just what an 88 year old 60% disabled veteran needs to get off his assorted collection of stuff (waiting to be used…or junked). I just found this older post. What a wonderful idea utilizing serving ware for vases!! !